Sir John William Laing (1879–1978) was a British entrepreneur in the construction industry. He inherited his father John's building business – which is now known as John Laing plc – in the early 1900s. John William Laing was born in Carlisle in 1879. His paternal family are from Scotland. His great-grandfather David Laing had come to England in 1800 and lived in the Cumberland village of Sebergham. He was a builder who employed several labourers within the local area. He married and had eight children and built his own house. His eldest son was called James and he followed his father into the building trade: James also persuaded his father to move to Carlisle. The family and business prospered due to the boom in the country caused by the Franco-Prussian War of 1870. The war necessitated the construction of many new Woollen mills in the local areas close to the Laing’s business creating much work and a considerable growth in the value of there business. However the war time boom soon turned down and the Laing’s construction business had no contracts. It was around this time that John’s mother and father converted to the Plymouth Brethren. John went to school in the village of Sebergham. were he excelled and was quickly moved up two forms due to his aptitude. He left the grammar school and although he was academically talented and could have gone on to further education he joined his fathers business learning the trade from the bottom up. John Laing married Sarah Wood who was the daughter of a local farming family. 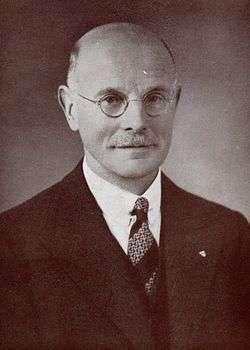 Laing gave the company its evangelical direction, which included pioneering ideas that nurtured staff, such as paid holidays, in the early part of the 20th century. In 1922 he gave almost 40% of his shareholding in the business to a charitable foundation. He retired from the business in 1957, was knighted in 1959 and died in 1978. Laing married Beatrice Harland in September 1910. His sons William Kirby Laing and John Maurice Laing and his grandson Martin Laing continued the family business. ↑ "John Laing Charitable Trust". John Laing Group. 1 2 "Laing, Sir John William". Oxford Dictionary of National Biography. Retrieved 20 May 2014. ↑ "About the Trusts". Laing Family Foundation. ↑ "Real Heroes – Sir John Laing". Request. Harrison, Godfrey (1954). Life and Belief – In the Experience of John W. Laing CBE. Hodder and Stoughton. Coad, Roy (1979). Laing: The Biography of Sir John W. Laing C.B.E (1879-1978). Hodder & Stoughton. ISBN 0 340 23985 9. Harrison, Godfrey (1954). Life and Belief in the Experience of John W. Laing C.B.E. Hodder & Stoughton. This article is issued from Wikipedia - version of the 7/18/2016. The text is available under the Creative Commons Attribution/Share Alike but additional terms may apply for the media files.